This Benriner spiral slicer offers you a creative and fast way of cutting, slicing to make curly and long spirals of vegetables such as carrots, daikon radishes, and cucumbers that will truly change your idea of cooking. This Benriner spiralizer is designed for both professional as well as residential needs and will truly amaze you when it comes to vegetables and fruit cutting ideas. The machine utilizes stainless steel blade construction so there is absolutely no issue with the durability and comes with a one flat edged straight blade that allows you to slice effortlessly any sort of food you want. 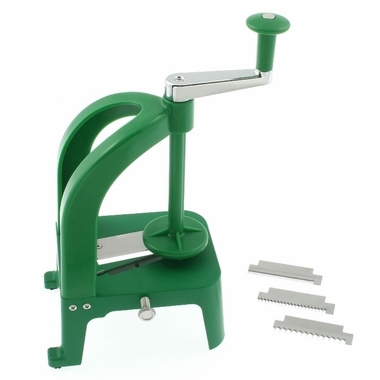 The Benriner spiral slicer is also very easy to use just set in a simple cranking motion and it churns out vegetables smoothly and neatly while ensuring excellent quality.